Ourasanah, 29, a senior designer for Whirlpool’s Advanced Studio in Chicago, finds he often has to describe the flavor profiles of insects. 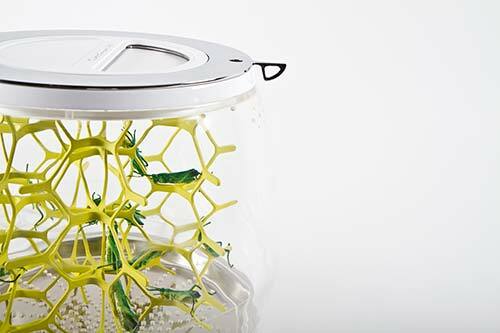 His product, Lepsis, is a kitchen appliance that grows, harvests and kills grasshoppers — and allows consumers not to touch the critters until it’s time to cook them. 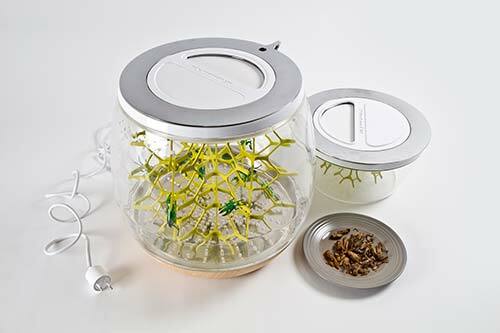 More than a culinary curiosity, the product aims to provide a viable solution to food shortage. Ourasanah’s device has earned him the Vilcek Prize for Creative Promise, along with $35,000, and he was named a finalist for Denmark’s Index: Award. After studying design at the University of Notre Dame, Ourasanah began working at a design consultancy in Philadelphia. Two years later, his father passed away. He realized, “I don’t want to waste any more time.” He moved to Sweden to attend the Umeå Institute of Design, and for his master’s thesis, he set out to create an alternative to the West’s environmentally harmful meat addiction. 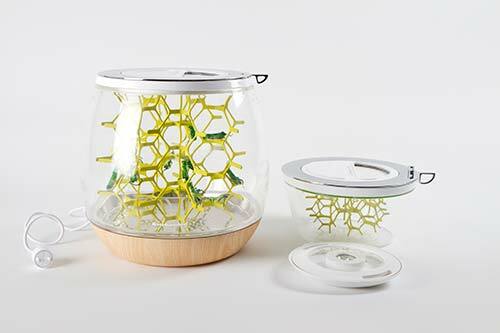 The sleek, terrarium-like Lepsis has fairly modest demands — some space on your kitchen countertop. 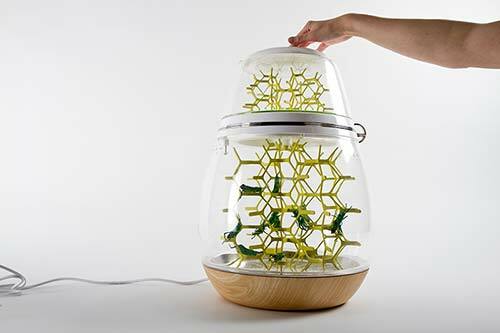 Its base unit warms the grasshopper eggs buried in its soil, and its middle nesting unit houses the hatched insects. “You have to harvest them as soon as they get to adult size,” he says. “Otherwise, they start eating each other.” The detachable feeding section also keeps the insects from regarding one another as their next meal. A light attracts the grasshoppers into the harvesting unit — which they can enter but can never leave. When asked how the harvester keeps the insects from hopping back down into the nest, Ourasanah demurs: “That’s a proprietary part of my design.” The detachable harvester then pops into the freezer, where the grasshoppers literally freeze to death. “What I love about this project is it’s about real-world issues and it has potentiality — it could become a reality,” says Zoë Ryan, the John H. Bryan chair and curator of architecture and design at the Art Institute of Chicago, who served on the Vilcek jury committee. Ourasanah wants to realize that potential. For his master’s thesis, he found a corporate sponsor in KitchenAid, but the company decided not to take Lepsis from prototype to product. For Lepsis to make the leap from a design prototype that cost $5,000 to build to a product that could cost consumers from $300 to $500, Ourasanah says it would need to be re-engineered with cheaper materials for mass production. So far, Ourasanah says, he has been approached by three investors, but he chose not to pursue them. They wanted to market Lepsis in Africa and Mexico, whose populations are among the 2 billion in the world who already engage in entomophagy — the eating of insects. The U.N. endorses that sentiment. Its Food and Agriculture Organization promotes the consumption of insects, which require significantly less land and water than cattle. Livestock production accounts for 70 percent of all agricultural land use, and the global demand for livestock products is expected to more than double from 2000 to 2050. Yet the U.N. agency also acknowledges the biggest barrier to Western countries’ adoption of insects as an environmentally friendly protein source: consumer acceptance.